“Voices from the Void” is the debut album from the new Chilean atmospheric doom black metal band Astral Root. Nikolas “Deatheory” E. (vocals, guitars, lyrics) and Rodolfo E. (bass, keyboards, drums) from Antofagasta are their only members. They formed Astral Root probably in 2012, but there is not much info about the band’s bio. They signed a deal with the American label Razed Soul Productions and released their debut full-length album on the 20th of March 2014. The music of Astral Root isn’t following any specific genre, but moves between several melancholic atmospheric music styles. There are 5 lengthy tracks in the album that lasts for 48 minutes. Their songs move between slow and mid tempo speeds, but there are many changes and variety in the music, as well as a few faster outbreaks. The band is playing a mixture of atmospheric black metal with doom and depressive influences, enriched by acoustic passages, creating a very balanced result. Both guitars and drums have a quite warm and natural sound. Their melodic guitar riffs are trying to combine the melancholy of black metal with the sad “warmth” of doom metal and the outcome is quite interesting. Vocals are mostly deep raw black metal growls, not very extreme though, while the few clean melancholic male vocals are more than welcome in their sound. The instrumental piano based track “Absent” works very good as an interlude in the middle of the album, revealing even more possibilities and fields of exploration for the band. 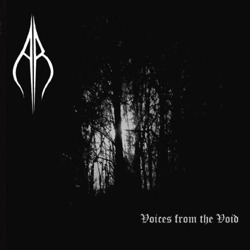 “Voices from the Void” has a quite good production for a debut album, with a raw unedited, yet very clear sound and an underground aesthetic, serving perfectly the overall atmosphere of their music. All their lyrics are written in English, speaking about dark, sad, sorrowful personal thoughts and emotions. Astral Root offer us good music in their first effort and I believe that fans of this genre will find it very interesting. I think that the band has still some things to improve in its sound and try to create an even more personal work, since they chose a quite demanding and difficult genre. “Voices from the Void” is released via Razed Soul Productions in a standard jewel-case CD limited to 500 copies. It comes with an 8-page booklet that includes all the lyrics, while the artwork is by Deatheory with the help by Grey Scarlet. You can visit their Soundcloud page or their label’s official Bandcamp page, following the links below and listen to some of their songs.